Sky Sports have since denied Harte’s claim. 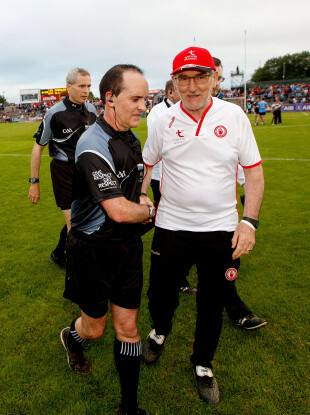 TYRONE MANAGER MICKEY Harte denied he had any influence over the dimension of the Healy Park pitch, after his sides’ loss to Dublin on Saturday night. The sidelines were moved in earlier in the week while relaying work was going on, with the suggestion from some quarters that Tyrone were attempting to deny Dublin their usual dimensions for their attack. “This narrowing of the pitch is nothing to do with me at all. That was a request from Sky, that they would like more clearance at the side for all their technology,” the Red Hands boss said. The Irish Independent reports this morning that Sky Sports have denied Harte’s claim they requested the pitch be narrowed. The sidelines seemed to be a matter of great fascination for Dublin players and mentors prior to the game, some players choosing to get their sightlines from the perimeter, while two Dublin selectors did a full lap of the pitch, pacing it out. There is no doubt it had some effect on the match, with Stephen Cluxton’s kickouts struggling in the final quarter of the game, but Dublin manager Jim Gavin denied it. Gavin was on safer ground when appraising their progress, becoming the first side to qualify for the All-Ireland semi-finals through the Super 8′s series. “Two games down in the All Ireland quarter final round robin series and we have four points on the board and that is satisfying. It was a great experience, we enjoyed it and the guys were really looking forward to it all week and they weren’t let down by the crowd,” he said. As much as Tyrone put up something of a challenge, Red Hands manager Mickey Harte struggled to put the worth on it, in the context of having to go to Ballybofey and needing at least a point to progress in a fortnight’s time. “If we go and perform well in Ballybofey and get a result there, then we can say this was a great match for us, in preparation for that. But, that has to be done yet so until we arrive in Ballybofey and arrive out of it with a result, then we won’t be able to say much about that,” he added. Email “Narrowing of the Omagh pitch 'was a request from Sky' — Mickey Harte”. Feedback on “Narrowing of the Omagh pitch 'was a request from Sky' — Mickey Harte”.